Cream Cheese Lasagna - AMAZING! 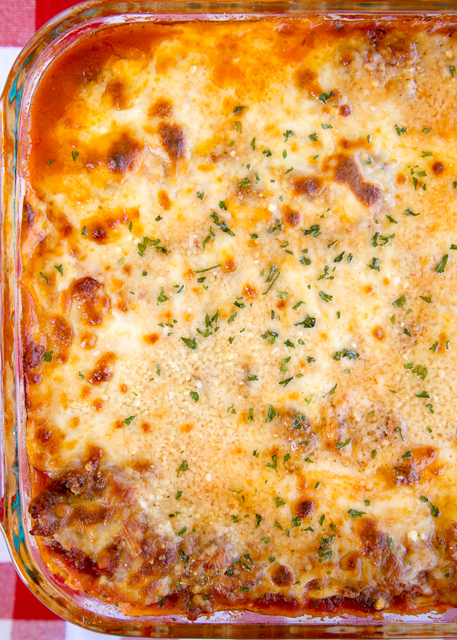 This lasagna is THE BEST! The cream cheese filling makes the casserole! Everyone LOVED the addition of the pepperoni!! Can make ahead of time and refrigerate or freezer for later. Lasagna noodles, hamburger, pepperoni, spaghetti sauce, cream cheese, cottage cheese, sour cream, parsley, mozzarella and parmesan cheese. SO GOOD! We make this every Christmas Eve. YUM! Lasagna at the holidays is one of our family traditions. Growing up, I was not a big fan of turkey. 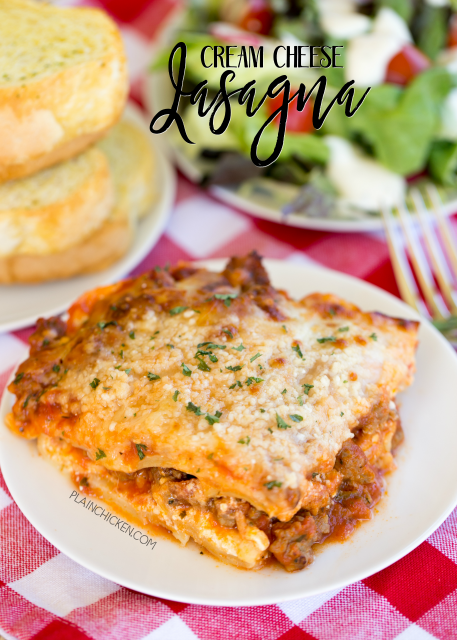 We would always have lasagna the night before the holiday so that I could eat leftovers for the holiday meal. I will eat some turkey and dressing now, but we still have lasagna on the night before Thanksgiving and Christmas Eve. This is not our traditional lasagna recipe, but I couldn't resist giving it a try. Let me tell you, this was fantastic! It was so easy to assemble and it tasted AMAZING! We ate this for dinner and reheated leftovers for at least two days. SO good. I loved the addition of the cream cheese to the cheese layer. So creamy and yummy! This can be made ahead of time and refrigerated overnight or frozen. I would freeze it unbaked and let it thaw in the refrigerator for 24 hours before baking. Just make a quick salad and some garlic bread and you have an incredible meal that is sure to please everyone! Preheat oven to 350ºF. Lightly spray a 9x13-inch pan. Set aside. Combine cream cheese, cottage cheese, sour cream, parsley and eggs. Stir well. Spoon a small amount of meat sauce into bottom of prepared pan. Layer with half of cooked lasagna noodles, half of cream cheese mixture, half of pepperoni, half of meat sauce and 1 cup of mozzarella cheese. Repeat layers. Top with remaining mozzarella and Parmesan cheese. Cover and bake for 30 minutes. Uncover and bake an additional 10 to 15 minutes, until cheese has slightly browned. Remove from oven and let sit for 15 minutes before serving. Has anyone made this with the no boil lasagna noodles? I was wondering the same thing! I am going to try it that way! This sounds delicious to me, Steph. Will be perfect this coming rainy weekend, I think. I have made this two times now . I used the no boil noodles and the only thing was that on the edges of maybe 2 or so noodles it was a bit crispy but I have had that happen with boiled noodles too. Maybe that is just me but it turned out great so that is why I made it two times :) . I do not use meat in my lasagna and my family still loved it. Can you use the no boil?